How many of you regularly ski a public lake? Personally I've never been on a private lake but I know at least one pro grew up on public water. I live on a public lake in southern WI. I free ski alot and then throw in the portable course. I usually go ski on a private lake or a semi-private lake to ski the course. Public lakes are all we ski. 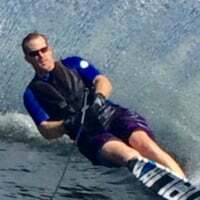 I get an invite to a private lake about 15 minutes from my home a very few times a year, otherwise it's all public water skiing. Dawn patrol on Saturdays for the last 25+ years with a portable to get any decent water. One of the numerous things that drove me to start my business. Just like Ed, live on public lake for 14 yrs. Good thing is our lake has a very small, no parking, pretty crappy launch so keeps most "non-lakers" off. We have a permitted course on the lake but as Ed says, it's at dawn or forget it. Either a "wally" or "bayliner" will come out soon after, fishing or towing a tube, and then there's the wakeboarders the rest of the day. Also only get 4 continous passes before the reverb comes back into the course, then a 15 minute or so stop before next set. Not like private lake skiing but still pretty dang good considering it's a public lake. I grew up skiing on both private and public. Have logged more hours public by far. Yeah, you gotta ski before 8 am, or forget it.. sometimes you can get a good run at sunset. I moved to a private lake 4 years ago.. and before that had joined a private lake for 6 years. Feels like you can't get better on public water, but you can maintain. Public lake for me three days a week, Utah Lake. When the water is high the Utah Water Ski Club site is like a private site with lots of protection but when the water is low we have to move to a open spot with little protection from wind and other boaters. Public H2o for me too. Tuney, where do you live and ski? Come on down to God's country in Houston, get a set or 3 on our private lakes, then prepare to move close to, or on one. Taint nothing like them; better than advertised. I ski a public lake every day. Our main site is on Lake Placid, NY and our secondary site is on Lower Saranac Lake. The picture with Whiteface Mountain in the background is LP, taken near our course. The ominous photo is Saranac looking down the course. The ski shot is in the course on LP. The brownish shot is the Atlantic Ocean, and while technically public, I did not intend to post it, but after selecting it, I couldn't get rid of it. I grew up on and still live on public water in Mass. We ski early mornings during the week and on weekends. During the week you can still get calm water during the day and sometimes during evenings because our course is tucked in a cove. I skied on public water for 12 years then moved to private water last year. I still love to hit the public water. I love the atmosphere and people its great but the rollers are killer. Train on private have fun on public thats how I roll. Train almost entirely on public lake -- same one as Chef23. Certain times are not workable, but a surprising number of times are. Grew up on a public lake and live on a public lake here in South Canada (MN). Ski on private sites when I can. Had three courses on my boyhood lake my buds and I installed. Only one on my present lake but I can fish, swim, party barge, and Wally when and where I like. Used to ski a lot in a public ski lake until 2005. I guess I have skied more in the past 6 years than all I skied in the previous 25 years. Split my time between a salt water tidal flat on Long Island which is public, and a private lake 65 miles north of NYC. Kind of 70/30%.The 70% being salty. For the guys who like to partake in a cold brew after skiing there is just something about that salty water that makes those cold brews go down. I ski also 70%-30% with 70% being on public water. However for this year it might swap because of the issue of not having a consistent ski partner. At least I know I can get a set in anytime I want over at Picko's. To me it is not about public out private. natural or not. Some out the coolest sites I have ever skied were not dug by a big yellow tractor. don't ski the course so I don't mind being on public water. Love morning sessions, love sneaking during the day if I can and LOVE sunset skis. Plus I love being able to putz around on the water all day just hanging out. Doesn't hurt that I grew up on the lake and will always have a spot there. Hard to give up everything I can do right from the dock on public water. Plus someday when I get to retire I will be skiing all the time during the week, the plus to public water that is really only busy on weekends, I love those city people who go back to work on Sunday. I ski 90% public water on my home lake on a portable course with balls that float too high. Because I work I have to ski before work, which translates to 6:15AM. If I was retired I could ski on weekday mornings pretty much anytime with the occasional disruption from fishermen. Evenings and weekends are unworkable. Try water in the turn balls to make them set down. I do that with my turn balls for my portable course, really not that big a deal to haul the little bit of additional weight around. Works great. 90% of the time I ski at the private ski club lake but once a summer we take a vacation with 2 other families to a pubic lake somewhere. Last year we made it down to Norris Lake in TN- absolutely beautiful trip and drove about 25 lake miles to find a public ski course made out of bleach bottles and milk jugs. @Razorskier1 Ed has good advice. Buoys filled half with water work great. Have them on my float course. They sit at correct hight and dispace much easier than air filled if hit. I did have to add a little red brick (clipped on) to the end of the PVC at the ball to get them at reg hight but that's just 6 little bricks (red ones with 3 holes). I have the file Thomas Wayne posted somewhere a couple of years ago on how to convert a 1/2 gallon garden sprayer into a water injector for buoys if anyone wants/needs it. Be happy to send it to you @razorskier1. Takes like 5 minutes to make the conversion, really simple to do. I'd like to see that, Ed. Sounds like a good solution for the turn balls on our two swamp courses. Public water for the past 54 years. We leased a private lake for a few years but, I prefer the "Big" Lake. I ski after work and have an amazing group of ski buddies who are all good drivers. We have been skiing together for years and have had a ball. We may not get the quality water as consistently as private lake skiers, but water conditions for M3, M4 and M5 at Wilmington last year were great! The great equalizer. I would rather ski with my buddies on public water than ski with a bunch of whiners and speed control bashers at a perfect, private site. I guess that it is the jumper's mentality. What we have is kind of amazing, because our course is off in a cove and many ours of the day skis just like a private site, but the rest of the time we have all the advantages of a public, multi-purpose lake. And all in easy commute to tons of employment options. Hm, maybe I'm advertising too hard. Please don't move here and take my water! 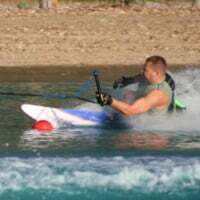 I grew up on a public lake without any access to a slalom course. I built a private lake and am only 4-miles from access to the Grand River, upstream from Spring Lake, and within 100-miles of over 100 other lakes. I have the best of both worlds. Grew up on public in MN. Did the dawn patrol. But really liked the verity of other things to do on the lake like cliff jumping/diving. Moved to FL and baught onto a no public access natural small lake with a course. Very few of the 20 homes use the lake. Best of both woulds as we get to pull kids tubing, go sailing on a little Catameran and fish ( although I hardly ever fish ). Ski 100% on a public lake. 2500 acres, so we ski at 6:30 or 7am, depending on sunrise. We get surprisingly good water, but obviously have some unskiable days. I love to be on a bigger lake for everything but skiing, so we take the good with the bad.